Hewson Landscape of New Jersey performs Landscape Maintenance services for commercial, industrial and government properties, including Landscape Design, Tree Service, Hardscaping and more. Our clients include corporate headquarters, remote sites, apartment complexes, condominium communities, age restricted residences, shopping centers, office buildings, government bases, public grounds, and much more. 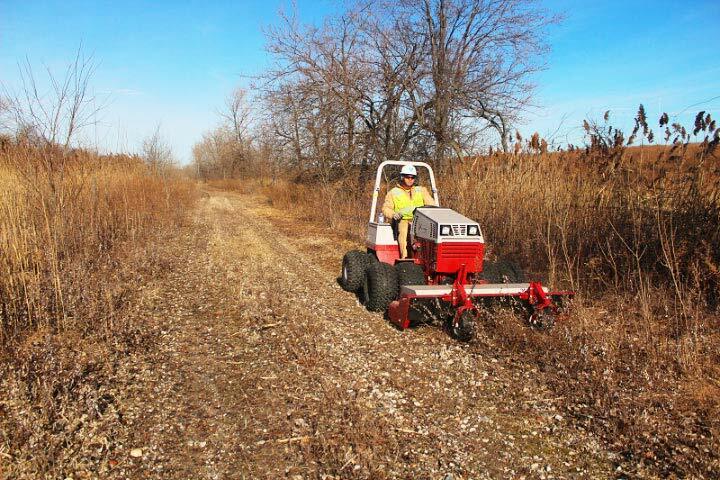 We have the equipment to perform grass mowing for solar fields, landfills, reservoirs and cell towers, right of ways, public areas, compressor stations, retail and commercial entities. Depending upon the application, we tailor the type of grass cut (manicured or rough) based upon the client's requirements. We perform all aspects of site maintenance services including mulching, weed control, pruning, cleanups, security fence line clearing, irrigation, and other related landscape maintenance services. Whether it's creating comfortable space for your employees to enjoy lunch outside or installing a privacy barrier with trees, we can discuss and design a custom fit for your location. Hewson has experience installing trees, shrubs, perennials, annual flowers, brick walkways and patios, and retaining walls. For industrial sites we can add quarry process road stone and blue stone for access roads, and decorative stone to shrub beds. 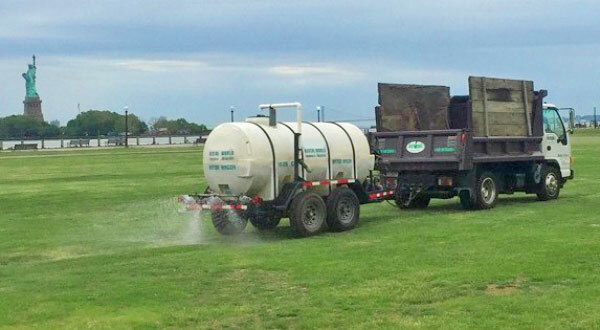 Restoration services, where we come in and restore a lawn or site due to another contractor's demolition or excavation work, includes hydroseeding, delivery and spreading of topsoil, sodding, seeding, and blanketing with hay. We are a New Jersey DEP Licensed Pesticide Applicator Business (License #96741A) and a New Jersey DEP Licensed Commercial Pesticide Applicator (License #22486A). We are also a New York DEP Licensed Business (Registration #15289) and a New York DEP Commercial Pesticide Applicator (License #C0839046). You can have peace of mind knowing that Hewson Landscape is properly certified, licensed and trained by the Department of Environmental Protection in the correct and safe use of pesticides. Eliminating invasive weeds around sub stations, fence lines and storage yard facilities will protect your assets and give employees access to work without encountering ticks, mosquitos and other pests. Accomplishing this can also help prevent theft and vandalism, and damage to your macadam and concrete. It might also help you avoid inspection by a code enforcement officer, which could lead to violation fines. We provide ground to sky tree trimming in right of ways, tree removal, stump removal, storm cleanup and wood chipping services. 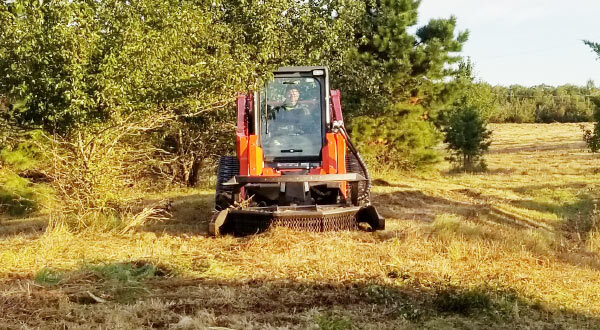 We provide land grading, land clearing, excavating and backhoe service, drainage system correction, slope repair and stabilization, and erosion control. Hardscaping is the backbone structure of any landscape plan. It's always best to create an entire plan, and then implement your design in stages, budget permitting. We install pavers for walkways and patios, retaining walls, and decorative stone. At Hewson Landscape, we handle all your NJ, Southern NY, Eastern PA and Central CT Commercial, Industrial, Municipal and Government Landscaping, Turf Care, Land Maintenance and Tree Service needs. Call us at 908-222-3616 or email us. © Copyright Hewson Landscape Inc.